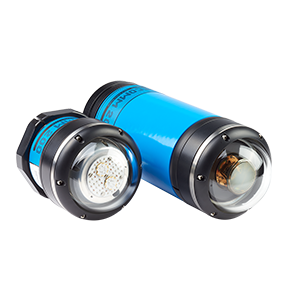 BlueComm 200 provides subsea wireless optical communications up to 10 Mbps at ranges up to 150 metres, enabling a range of application options including wireless underwater video and vehicle control (telemetry from several concurrent video cameras is possible). The BlueComm 200 uses an array of high power light emitting diodes (LEDs) that are rapidly modulated to transmit data. It uses a separate photomultiplier tube as its receiving element. The photomultiplier tube allows sensitive receive capability and communication ranges of up to 150 m. Due to the sensitivity of the photomultiplier receiver, the emitter is housed separately to prevent self-interference. All BlueComm 200 modems provides subsea wireless optical communications up to 10 Mbps. Two versions of the BlueComm 200 are available, operating at different wavelengths. BlueComm uses time division multiple access (TDMA) methods to providing a bi-directional high speed low latency link that supports TCP/IP based network protocols. Allocation of bandwidth ratios in each direction is user selectable and fully flexible. The allocation of bandwidths is ideal for applications where high-speed data transfer is mostly required in only one direction such as for extraction of large data volumes from seafloor instrumentation or sensors. Optional integrated acoustic positioning and communications provide methods for locating the device, waking it up and managing the optical link. Once a connection is established, BlueComm will immediately begin transferring buffered data. 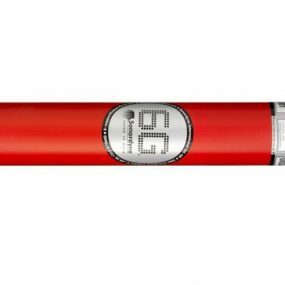 Optical data transmission is highly efficient, enabling more than nine gigabytes of data to be transferred using only the energy contained in a single Lithium D sized battery cell. 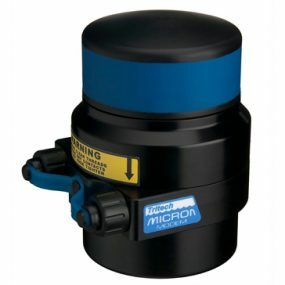 All BlueComm 200 models are rated up to 4,000 metres water depth operation. BlueComm 200 operates using visible light. Visible light can travel significant distances through water meaning that BlueComm 200 has a range of up to 150 metres. This makes it an excellent tool for wireless transfer of video and direct control of a vehicle in AUV applications. It is also ideal for data harvesting applications. 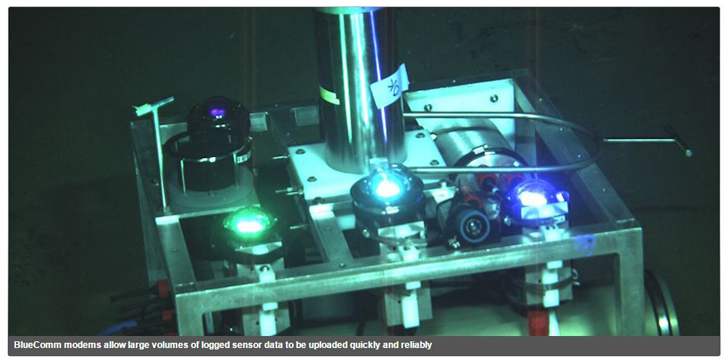 Using BlueComm 200 an AUV or ROV can transfer large volumes of data up to ten thousand times quicker than acoustics. Artificial lights and sunlight can interfere with BlueComm 200 and that would limit its operating range. BlueComm 200 UV works just like BlueComm 200, however it uses a shorter wavelength in the UV spectrum. This means that it can operate even in the presence of artificial lights. Operating in the UV Spectrum, the BlueComm 200 UV can work at ranges of up to 75 metres. 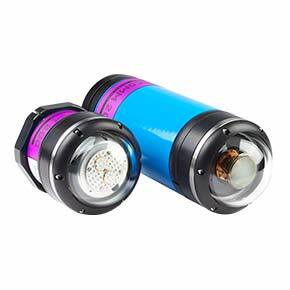 It is best suited for ROV or AUV applications that require the use of lights, for example, when recording video.